Before you comment below with your entry for this Olympic Empath Contest, please read all the juicy details below. The contest rules are coming, but first, I’ve just got some really cool stats to share with you. And they’re not about sports. we had it last year too, 8-7-15. Or 7-8-15. Fun! You get the pattern. What a winning date! Worthy of Olympic champions, and the rest of humanity too. Because any stand-up, honorable person living now is evolving super fast. With special speed likely for those who are on track with THE NEW STRONG. In the arena of deeper perception, why would Skilled Empath Merge be most suitable for an Olympic-themed contest? Body language and expression, close to the surface, can tell you a lot, there’s no question. Face Reading can tell you so much more. At this blog, and elsewhere, you can find celebrity readings where I use my favorite system, Face Reading Secrets®. Aura Reading is such a great resource for learning what makes people tick, Olympic athletes included. Of course, I use the system of Aura Reading Through All Your Senses®, which any of you can use to develop Stage Three Energetic Literacy. Way more useful than being energy sensitive! Skilled Empath Merge is like an aura reading, and its described in the same way: One chakra databanks at a time. Only Skilled Empath Merge is more personal and, therefore, more powerful in the quality and amount of detail available. So that’s what I’m choosing for prizes this time. If you and I cannot be Olympic competitors this year, at least I can report on what it’s like to be one. Same with other outstanding athletes. Whoever wins, according to the rules for this Olympic Empath Contest, I’m game to research with that full intensity of a Skilled Empath Merge. In honor of this year’s brilliant, dedicated athletes in Rio, I’ll award three prizes for this Olympic Empath Contest. Think of them as gold, silver, and bronze. Or just fun! Supply the name of your candidate. Feel free to choose any athlete you like. OR vote for an existing nomination. Unlike an Olympic event, the more who win, the merrier. Describe why you are curious. Why do you wish to know more about what it is like to be that athlete? Supply at least one sentence. More would be fun. If you’re nominating somebody for the first time, please supply at least one photo link to your nominee. At least a full head shot from the front. Even better give a front view that shows the entire torso. (Those legs would be cute, for sure, but I won’t need them to do Skilled Empath Merge. A great thing about nominating an athlete is that one can find those full-body shots quite easily. Yes, 9-9 is quite a festive pair of numbers, although nowhere near as amazing as today’s 8-8-16. I’d like to nominate Simone Biles, US gymnast. Official photo(s) from USA gymnastics. I’m curious about her because she’s basically breaking the score scale in gymnastics – scoring 2+ points above everyone else in an event normally decided in tenths and hundredths of one point. Every other gymnast is calling her the best ever, more on par with Michael Jordan or Serena Williams as a giant in her sport than any contemporary gymnast. She does skills in her floor routine nobody else in the world can, including men. I will follow Kyler in nominating a gymnast as well-Oksana Chusovitina. Oksana is the oldest competing female gymnast in history at Rio this year-she is 41 years old. This is interesting as,like I’ve read on the web-her “muscle memory is older than many of the gymnasts she’ll face in Rio.”. I’m so curious where she gets her passion, drive and energy for this elite athleticism. I love those dates! That’s awesome! Like a little wink from the universe, or like the fabric of the universe is showing through: Really, all things are in order, and as they should be. Holding strong. A Hungarian Olympic swimmer coached by her husband. She’s competing in 5 different swimming events! She had some major setbacks in her career and really turned it around so I’d be fascinated to learn more about her! I’d like to nominate Yusra Mardini. She is on the Olympic refugee team. She swam in cold ocean waters pushing a dinghy from Turkey to an island in Greece for over three hours. Her story really tears me up. I am interested in Michael Phelps. I read that he went through a lot of struggle in his life until he recently became religious and found Jesus. Did it really help him to become strong again and start training for Olympics and actually winning? I am also curious about Simone Biles. She’s incredible. I have someone else to nominate, but I’ll need to do it from the computer and not my phone. Need to find the article that had her picture again. Okay, found it. I’d like to nominate Ibtihaj Muhammad. She is an American competing in fencing, and the first hijab-wearing Muslim woman on a US team. The picture is partway down the page, of Ms. Muhammad standing with Pres. Obama. The article compares her to Muhammad Ali, a comparison she says she doesnt measure up to. KIRA, one of the things I like about you is how you honor your commitments. You said you would track down this info and here you go. Thank you. I’ve been spending about an hour each day watching saved broadcasts of these Olympics, and reading newspaper articles. So far I’ve known about most of the amazing athletes nominated here. If there were time I’d read auras or do Skilled Empath Merges on every single one. Keep those nominations flowing, Blog-Buddies! Part of why I’m interested in Ibtihaj Muhammad (but not the main part) is because I took a fencing class in college, so I can relate to that sport a bit better than most. About another swimmer, EMILY T. and EVGENIA, here’s a bit of splashy name dropping. An Olympic gold winner (multiple) is swimmer Katie Ledecky, from the metro D.C. area. Today I made it out to the pool in my neighborhood and chatted a bit with my pal Damian, the lifeguard. He knows the 19-year-old world record maker and breaker. Knows her because they swam together a few months ago at an event at Claude Moore Park. Katie Ledecky swam faster than anyone, men included. “They were all toast,” Damian said. Which is a funny image to this writer, when you think of swimmers turning into toast while dunked in the pool. Anyway, guess where I go to swim during most of the year, when the neighborhood pool is closed? The pool at Claude Moore Park. Wowee! Thanks for doing this contest, Rose! I would like to nominate soccer player Cristiano Ronaldo, considered one of the best in his field. I am fascinated by him, especially as his personality seems to be full of contradictions. He is portrayed as egregiously narcissistic and selfish, yet is known to be one of the most charitable athletes around and is one of the few soccer players without tattoos, as that would render him unable to donate blood. I guess I would like to know what’s really going on there! Also, I think hes a winner, because he just never seems to give up. He keeps on wanting to improve, to be the best. His passion for his country at the recent Euro champions was in direct contrast to his (also brilliant, and many say, better) contemporary Leo Messi, who said he would no longer be playing for his country as they never win. He never seems to let his despondency get the better of him for too long. I admire that. I just think her happiness in this photo radiates out of this picture, and that’s what makes me interested. Also, I have to say, what a cool surname :-). Oleksiak! I love it :-). 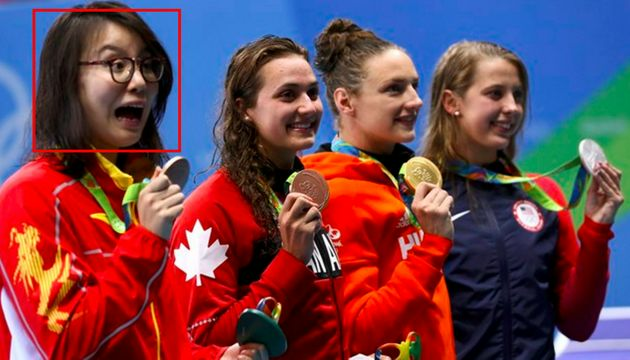 As of the article’s date, she has won 2 bronze medals, but (as most of the pictures in the article show) she is way more excited about those than the silver and gold winners seem to be about theirs. I wasn’t sure how well it would work for a reading, though. Oops, I said she won 2 medals; I misread the article. She won 3rd place in a semifinal match and then tied for the bronze medal. So 1 medal. Oh, and what interests me about her? Well, in general, I like to see people enjoying themselves, but also, I’ve seen a lot of comments from some Facebook friends who’ve been watching the Olympics about having at least one “ordinary” person in there for them to commiserate with (presumably someone near their own levels of ability in various sports). 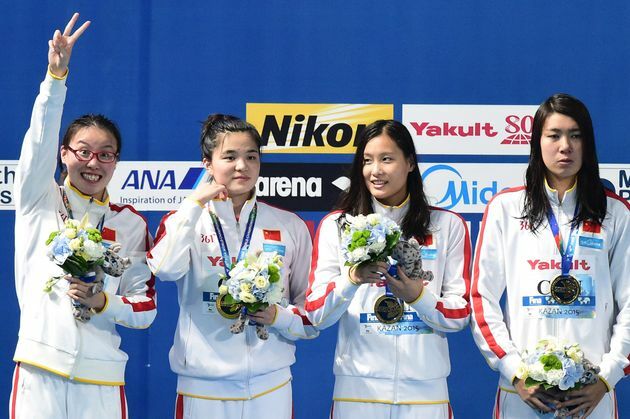 Fu Yuanhui is clearly a world-class athlete, but her reactions strike me as those of the “ordinary” athletes my friends are imagining if such an athlete should unexpectedly win something. So in that sense, she seems to me to be the closest analog to one of us ending up in the Olympics and winning a medal. She is clearly not taking her ability for granted! KIRA, it’s lovely to have nominations continue for this contest. I also am interested and would love to know more about Michael Phelps. He was already nominated by Evgenia above at number 13. Thanks so much to all of you who entered this contest. Expect the first, Gold Medal, prize to be awarded this week, with the Skilled Empath Merge to follow!